O que é a política regional? A minha região está abrangida? Corruption in public procurement harms the public interest, undermines public trust and has a negative impact on people’s lives. However, tackling effectively corrupt and fraudulent activities is a challenging task and requires a complex approach. Civil society as effective anti-corruption actor can give a valuable input in promoting transparency, accountability and preventing corruption. In order to look for new innovative ways of preventing corrupt practices in projects funded by EU funds, the European Commission's Directorate-General for Regional and Urban Policy and Transparency International joined forces in this new initiative. In March 2015, Commissioner for Regional Policy Corina Creţu and Transparency International Deputy Managing Director Miklos Marschall launched the pilot project ‘Integrity Pacts – Civil Control Mechanism for Safeguarding EU Funds’. 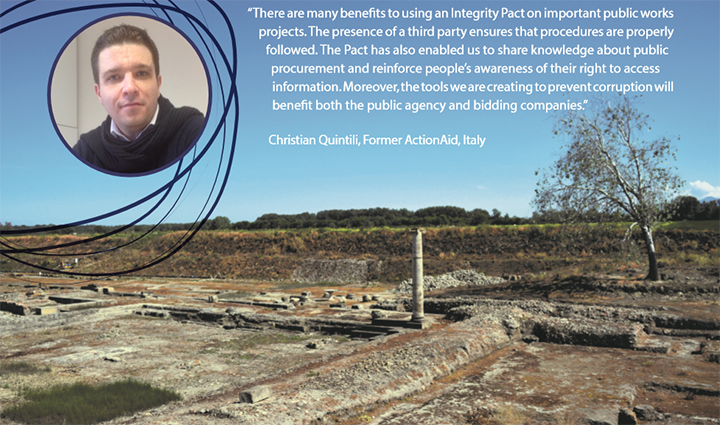 It aims to explore and promote the use of Integrity Pacts (IP) for safeguarding EU funds against fraud and corruption, and as a tool to increase transparency and accountability, enhance trust in authorities and government contracting, contribute to a good reputation of contracting authorities, bring cost savings and improve competition through better procurement. The second phase of this joint project began on 1 January 2016 and will run for four years. Through this project the Commission will support piloting of IPs in projects co-financed by EU Structural and Cohesion Funds in EU Member States. The experience from piloting Integrity Pacts will be shared and disseminated at the EU level. The initiative is part of the broader action undertaken by the Commission in tackling fraud and corruption, as well as enhancing administrative capacity in the use of EU funds and is a high priority for Commissioner for Regional Policy Corina Creţu. What is an Integrity Pact? An Integrity Pact is a contract between a contracting authority and economic operators bidding for public contracts that they will abstain from corrupt practices and will conduct a transparent procurement process. To ensure accountability and legitimacy, an Integrity Pact includes a separate contract with a civil society organisation which monitors that all parties comply with their commitments. To improve competition, promote cost efficiency and savings through better procurement. Following a call for expression of interest published on 22 May 2015, 17 projects co-financed by the EU Structural and Cohesion Funds were selected for this pilot phase. They were submitted by managing authorities and beneficiaries, while the selected civil society organisations (CSO) were applying to act as Integrity Pact (IP) monitors. Significant interest from both sides resulted in the selection of agood mix of projects from different sectors (transport, institutional building, culture, monitoring, environment, energy, education, research and development, integrated territorial investment, administrative capacity and health care) in 11 Member States (Bulgaria, Czech Republic, Greece, Hungary, Lithuania, Latvia, Slovenia, Portugal, Romania, Italy and Poland). The lessons learnt from these pilots will be disseminated and can be applied to many other EU co-financed projects in the future. periodic sharing and capturing of impact, lessons learned and best practices for project partners as well as the broader public. The Transparency International Secretariat will ensure the overall coordination of the project and will coordinate 15 CSOs which will perform the role of IP monitor, quality assurance of project implementation at all levels, promotion and dissemination of the project results, necessary training and capacity building, capturing and dissemination of impact, lessons learned and best practices. 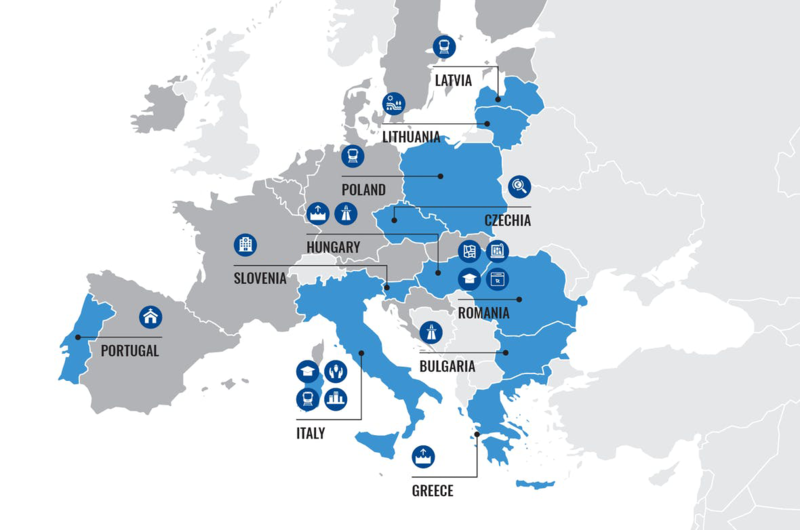 Integrity Pacts for 6 projects have already been signed (Bulgaria, the Czech Republic, Italy, Hungary, Latvia, Slovenia and Poland) and the respective civil society organisations have started monitoring the public procurement processes. Others are in preparation and would follow in the coming months. Consult the Integrity Pacts – state of play for the lastest information. 17 EU-funded projects will pilot Integrity Pacts - an innovative tool of ensuring more transparency, accountability and efficiency in public contracts co-financed by the European Structural and Investment Funds in the EU. They are part of a joint initiative by the European Commission and Transparency International "Integrity Pacts- Civil control mechanisms for safeguarding EU funds " and were selected following a call for expression of interest where the projects were submitted by managing authorities and beneficiaries, while civil society organisations were applying to act as monitors thus playing a valuable role in prevention of corruption and dissemination of good practices. The partners involved in the 17 projects gathered today in Brussels at a launch event. Thanks to the great interest and participation, the selection resulted in an excellent mix of projects from different sectors (transport, administrative capacity and institutional building, culture, monitoring, environment, energy, education, research and development, integrated territorial investment and health care) in 11 Member States (Bulgaria, Czech Republic, Greece, Hungary, Lithuania, Latvia, Slovenia, Portugal, Romania, Italy and Poland). The total amount invested in those projects exceeds EUR 920 million. The European Commission supports "Integrity Pacts – Civil Control Mechanism for Safeguarding EU Funds" with a budget of over EUR 7.2 million. This pilot phase will run for four years. The Transparency International Secretariat will ensure overall coordination of the project. It will coordinate 15 Civil Society Organisations (CSO's) which will monitor the IP and carry out quality assurance of project implementation at all levels, promotion and dissemination of the project results, necessary training and capacity building, capturing and dissemination of impact, lessons learnt and best practices. On 22 May 2015, DG Regional and Urban Policy published two Calls for Expression of Interest to Pilot Integrity Pacts in Projects Co-funded by Structural and Cohesion Funds. The objective of these Calls was to identify public authorities and civil society organisations in the EU Member States willing to pilot Integrity Pacts in projects co-financed by the Structural and Cohesion Funds in their Member State. We thank all those who applied and showed their interest in the initiative. In total, we received 32 applications from public authorities and 25 expressions of interest from civil society organisations to act as monitors. The evaluation process has now been completed. The list of shortlisted applicants is available. Shortlisted public authorities and civil society organisations are now invited to negotiate with each other the establishment and implementation of the Integrity Pact. Several applications were included on a reserve list . These applications could be re-considered in case Integrity Pacts do not materialise in the shortlisted projects in the country concerned and provided it is still relevant in the reserve project. At this stage there is no binding commitment on either of the shortlisted parties to conclude and implement an Integrity Pact – binding commitments will arise in case of a successful signature of an Integrity Pact. The Commission reserves the right, until an Integrity Pact is signed, to abandon or cancel the procedure. The overall co-ordination of piloting Integrity Pacts in EU Member States will be undertaken by Transparency International Secretariat, based in Berlin. The experience from piloting Integrity Pacts will be shared and disseminated at the EU level. (2) the call for civil society organisations in the EU willing to act as monitors of an Integrity Pact – - Application form . The deadline for submission of expressions of interest is extended until 9 July 2015, 23:00h Brussels time. DG Regio and Transparency International invite all civil society actors interested to participate in the call for Expression of Interest to pilot Integrity Pacts in Projects Co-funded by Structural and Cohesion Funds to an informational webinar on 8 June 2015, 11:00 Brussels time. The webinar will seek to briefly present the main aspects of the call as well as answer questions from participants. All answers will be documented and shared with those that cannot make the call. In case you would like to participate in this webinar, please fill out this registration form. As part of the pilot project "Integrity Pacts - Civil Control Mechanism for Safeguarding EU Funds", an international conference was organised by the Transparency International on 5 May 2015 in Brussels. The aim of the event was to raise the awareness about the Integrity Pact as an instrument to prevent corruption and discuss its applicability to the EU Structural and Cohesion Funds. The conference brought together representatives of civil society, EU funds managing authorities in the EU Member States and European institutions. For more information on the conference please visit: Conference "Integrity Pacts - Safeguarding EU Funds"
Commissioner for Regional Policy Corina Creţu will launch today in Berlin a joint pilot project "Integrity Pacts" with Transparency International to ensure Regional Policy funds are well spent for the real benefit of the people. This is one in a series of new measures the Commission is taking to help Member States, regions and cities effectively manage EU investments. The Integrity Pact was developed by Transparency International to support governments, businesses and civil society to improve trust and transparency in public procurement. The Commission now aims to pilot Integrity Pacts for several EU co-funded projects by the European Regional Development Fund (ERDF) and the Cohesion Fund. An Integrity Pact will be a legally-binding agreement between the contracting authority and the companies bidding for the public contracts that they will follow a transparent and efficient procurement process. To ensure greater accountability, those Integrity Pacts will include a monitoring system led by a civil society organization. Member States are strongly encouraged to make use of this initiative following a call for expressions of interest to be launched in May 2015. On 5 May, Transparency International is also organising a conference in Brussels to promote the Integrity Pacts. The experiences of these pilot projects will then be shared and disseminated among public authorities across Europe.